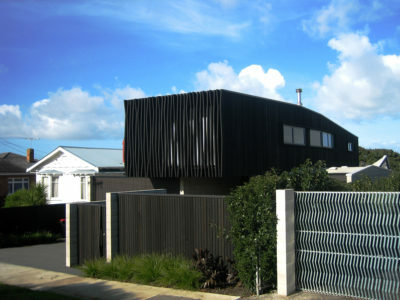 Located in Onehunga overlooking the Manukau Harbour is a modest home and studio for an artist. A composition of two black timber blocks are found separated by a rusty steel door. The blank facade, with its illusion of a two dimensional painting, masks a light filled angular interior space and verandah. Articulated towards the owner’s zen-like philosophy of a minimalist lifestyle; the large room functions as a painting studio, a living area, and a garage, for their prized vintage motor cycle. A wall ten metres long and four metres high illuminated with southern light is the focus for painting and exhibiting. A simple kitchen, bathroom and storeroom complete the ground floor, while the bedroom is upstairs with a private terrace and dramatic view. 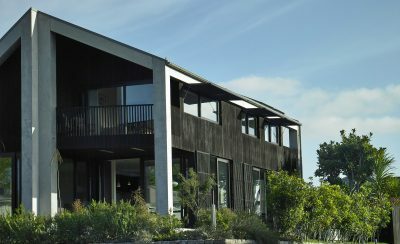 The forms and materials of the house reference New Zealand rural and vernacular architecture and have a synergy with the artist’s enthusiasm for New Zealand’s history. The house embodies the image of the artist as a “man alone”.